Saturday was Jonathan’s birthday pig barbecue. 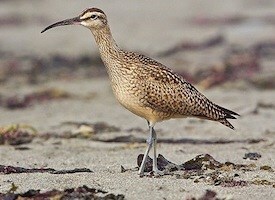 All our friends and neighbors who were at the beach for the weekend came by to help celebrate. Jonathan inaugurated his new barbecue patio and Dona Berta brought one of her magnificent cakes. 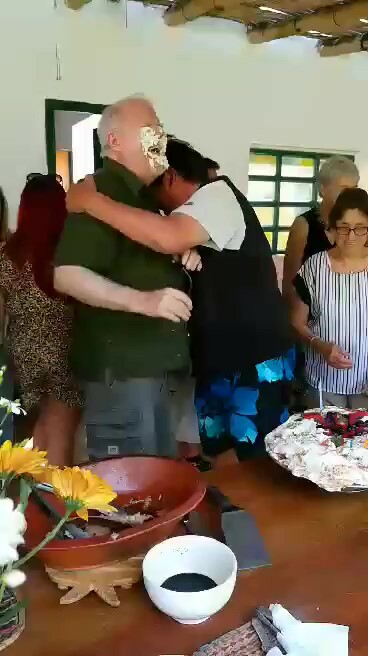 Pablo (R in photo), visiting from Cusco, said that in Cusco one kisses the cake and when Jonathan leaned over to comply his head was dunked in the whipped cream to roaring laughter. The cake is vanilla layers filled with manjar blanco, (caramel), canned peaches and fresh strawberries. It is frosted lavishly with whipped cream and topped with fresh berries. Not a crumb was left over. Sunday–For a few days an algae bloom washed in, turning the waves red-brown and leaving foam on the shore. 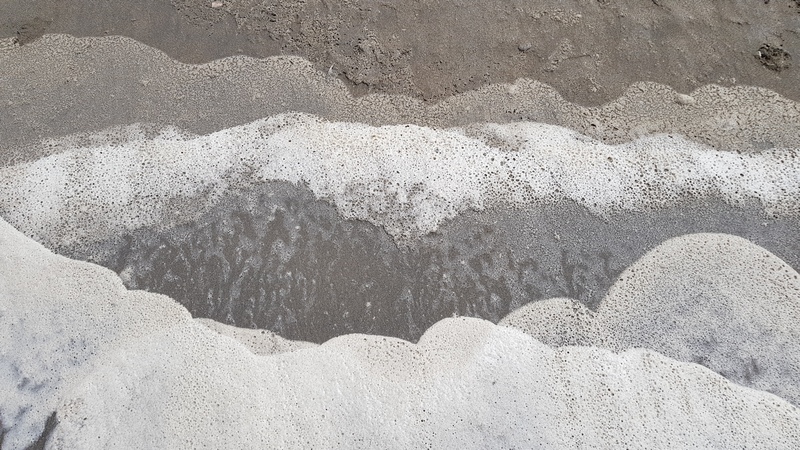 Not pleasant for swimming, but the foam made patterns on the sand. 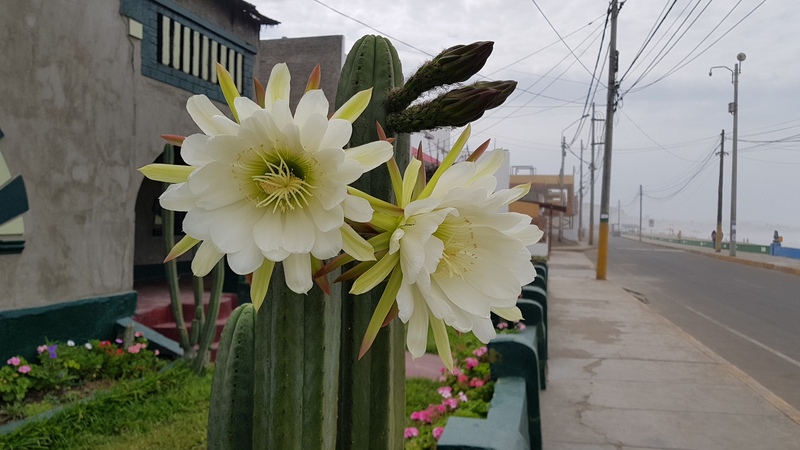 Monday–Today the San Pedro cactus down the street bloomed. The flowers come out about every second year and last only a few days. Tuesday–Thick, thick mist that dissipated only for a couple of hours in the afternoon. 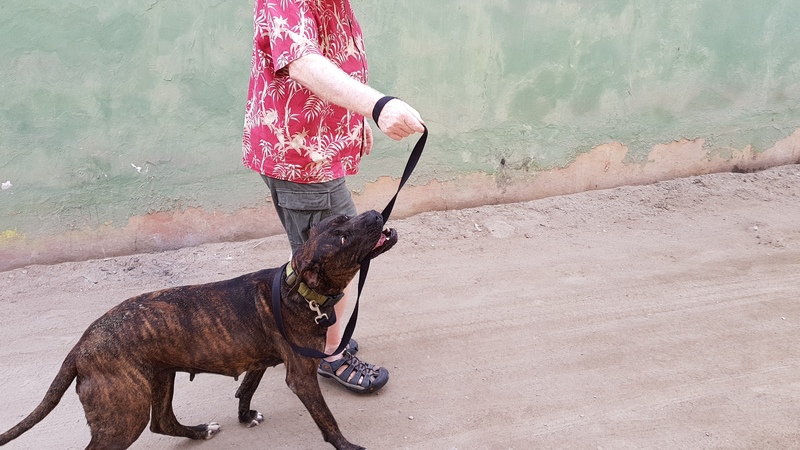 Orca was so anxious to go on her walk that she tried to drag Jonathan to the sidewalk. Thursday–The tide is as low as I’ve ever seen it, thanks to the Blue Super Moon predawn on the 31st. The water is also even colder than usual, 63°F, I’d guess. Even with sleeves and a short wet suit my swim was brief. Friday–Nothing day. We both ended up with stomach pains and spent the day resting and eating crackers. It’s not always paradise.